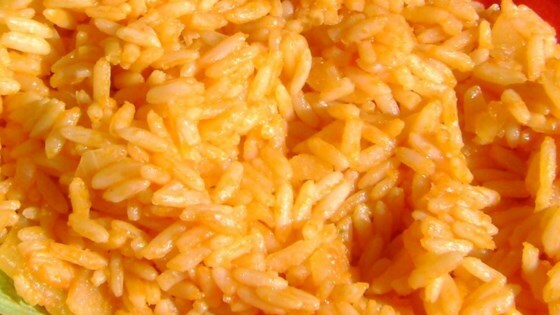 "This is the tastiest Mexican rice. My grandmother taught me how to make this very simple dish and it goes well with almost anything. Add green bell pepper, red bell pepper, or fresh tomato into the rice before simmering for extra flavor and color." Heat canola oil in a skillet over medium-high heat. Cook and stir onion and potato in hot oil until lightly cooked, about 2 minutes. Stir rice into onion and potato until rice is golden, 2 to 4 minutes. Pour water, tomato sauce, and chicken bouillon into vegetable and rice mixture; stir and bring to a rolling boil. Cover, reduce heat to medium-low, and cook at a simmer until rice is tender, about 15 minutes. Simple and easy recipe that gives you the flexibility to make it your own. I added salt, pepper, garlic powder, and onion powder. It came out great! I used Rotel instead of tomato sauce. I also used Goya seasoning and salt (to taste) instead of the chicken bouillon. I will definitely make it again. It tastes amazing! Went well with the quick & easy mexican chicken recipe on this site.